Adaptive utensils designed to provide help to those who need a little comfort and support when it's time for a great meal. When you suffer from tremors, arthritis, low grip strength or even Parkinson's Disease, it can be a challenge to even enjoy a simple meal. That's why we created a smarter, more effective solution for helping those with adaptive needs. Wide, Textured Grip Design Easier to use than your standard metal, ceramic or smooth-designed utensils, these forks, spoons, and knives feature an ultra-wide handle with silicone ridges that make it easier for someone to grasp and hold onto. Great for seniors, youth and anyone who needs a bit more support at the table, give back much-needed confidence with utensils that are made specifically for adaptive needs. Product Details: Adaptive Utensils (8-Piece Set) Wide, Textured, Non-Slip Handles Stainless Steel Construction Dishwasher Safe Make mealtime easier for those with arthritis, tremors, or adaptive issues. Wide, Non-Slip Grip: Each of our non-weighted adaptive utensils features a wider ribbed handle with raised, textured grips to improve dexterity and control. Stainless-Steel Durability: Along with a food-grade safe silicone handle, each kitchen fork, spoon and knife is made with dishwasher safe stainless steel. 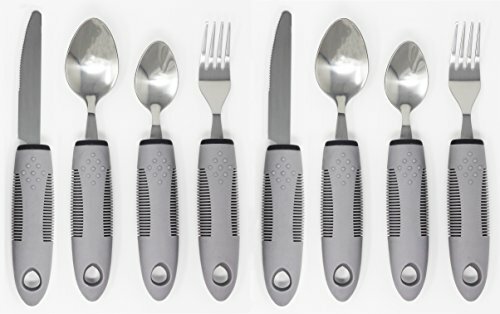 Matching 2 (4-piece sets): Every order comes with 8 unique eating utensils, including 2x Forks, 2x Knifes, 2x Dinner Spoons and 2x Soup Spoons to cover a wide range of meal choices.